Are you working on a remodeling or renovation project in your kitchen, bathrooms, laundry room, or any other part of your home? 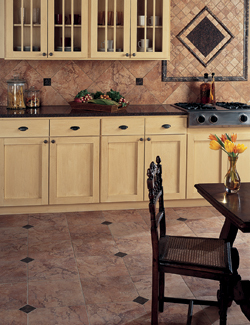 Consider adding stylish and durable vinyl flooring in Springfield, IL, from our flooring store. Available in a wide variety of colors, patterns, and styles, vinyl is a versatile and long-lasting material that is making a comeback in home design. Whether you choose vinyl tile flooring or vinyl plank flooring, we’re certain you’ll love your new floor. For years, vinyl floors have been known for their outdated and unattractive appearance. However, advancements in the flooring industry now mean that vinyl flooring is more stylish and durable than ever before! This is why it is so practical for every area in the home, including wet rooms such as the kitchen and bathroom. Our flooring store boasts an impressive selection of vinyl floors in our store and showroom. With knowledgeable flooring associates always available, you can depend on us to educate you about the many advantages this particular flooring product has to offer. We’ll help guide you to the perfect vinyl flooring that suits your style, budget, and performance needs. Vinyl Tile Flooring – As the name suggests, this particular vinyl product resembles high-end stone and tile flooring materials. With variations in color, size, and texture, this flooring looks and feels exactly the way you’d expect. While it offers the tile appearance that you desire, it also may prove more affordable than other porcelain, ceramic, marble, and granite tile options. Vinyl Plank Flooring – Vinyl planks are designed to resemble the regular plank shape of hardwood flooring. As vinyl is a manufactured material, its ability to resist spills, stains, and moisture is much greater than other available products. With different stain and texture options available, you can find the ideal wood-look you desire among our selection of vinyl planks. Vinyl flooring with the appearance of natural materials is a cost-effective alternative for homeowners and businesses that prefer lower maintenance floors or that can’t use materials like natural stone, ceramic, and porcelain. Vinyl offers an attractive alternative for home renovators looking for a lightweight and easy to care for type of flooring. Minimize your cost and maximize the value of your home improvement investment with vinyl sheet flooring. Available in numerous patterns, colors, and designs, this flooring option offers more than a variety of stylish looks for your flooring. It’s also incredibly durable, standing up to years of exposure to moisture, spills, foot traffic, and all the little accidents that are bound to occur in a family home. Because it’s installed in just a few seamless pieces, it is one of the most watertight choices available. Upkeep for these floors is much less involved and easier than the specialized processes required for other types of floors. Keeping your vinyl flooring in good condition is a simple matter of regularly sweeping up dust, cleaning spills as quickly as possible, and using protective pads under appliances and furniture to prevent scuffs or scratches. As the style and design of vinyl floors have changed, our technicians have remained updated on the latest installation techniques. This means that we provide long-lasting vinyl flooring installation for each and every client that invests in this type of flooring. We guarantee that the installation team will arrive to your home promptly, as well as complete all work in a timely manner. Every installation we perform is backed by an impressive pledge called the Lifetime Installation Guarantee. This promise states that if you ever experience installation-related problems with flooring installed by our team, we’ll make it right at no cost to you. In addition, our Ultimate Confidence Warranty covers all of our 4 and 5 Star Rated Floors. After 30 days, if you’re not satisfied with your floor for any reason whatsoever, let us know and we’ll replace it and even pay for the labor. We offer assistance and installations for residents of Springfield, IL, and communities within a 30 mile radius!